You may have had paella before, but probably never like this. We used eggs in our paella recipe to give it an extra source of protein and a unique flavor compared to other paella dishes. After a stressful day, sometimes the one thing you need to wind down is a great meal. This chicken paella with eggs recipe will be able to do just that. Your whole family will love this dish, where all the different flavors come together perfectly for a delicious meal. 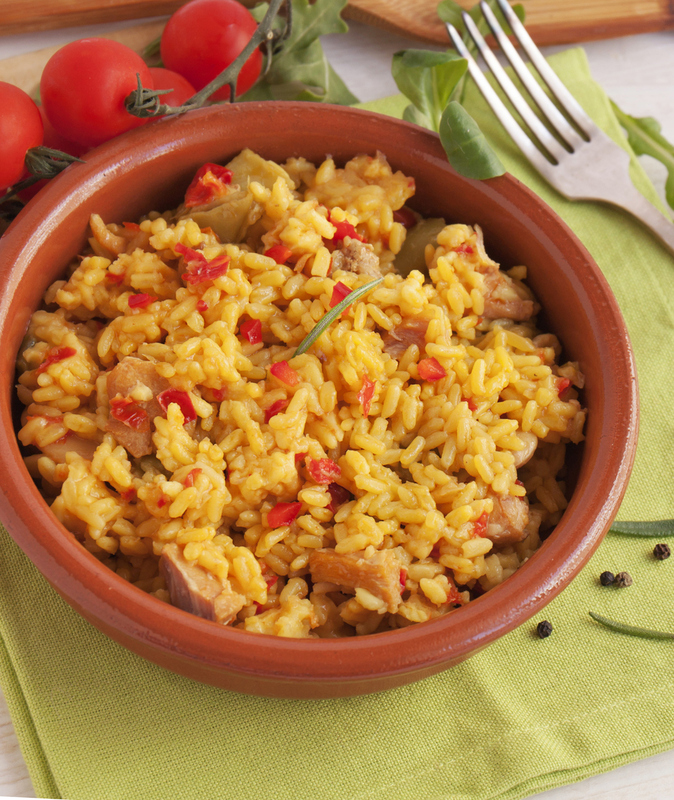 If you want to give this dish a try, check out our chicken and chorizo paella recipe below! In a large pan, heat the olive oil over medium heat. Add the chorizo sausage and cook it until it is brown. Remove the sausage and set it aside. Add the chicken thighs and season them with salt and black pepper. Cook the chicken until both sides are browned. When it’s done, remove it from the frying pan and set it aside. Add the onion and garlic to the pan. Saute them until the onions are soft and clear and the garlic is browned. Add the parsley and cook the mixture for another 2 minutes. Add the tomatoes and cook them until the mixture has a nice looking color and most of the liquid from the tomatoes has cooked off. Add the tomato paste, rosemary, bay leaves, saffron, sage, and crushed red pepper. Stir the mixture until the spices are well-combined and cook another few minutes. Sprinkle the rice over the top of the mixture. Saute the mixture until the rice is coated evenly with the vegetables and spices. Add the chicken stock and let it simmer for 10 minutes. Make sure the rice cooks evenly by stirring the mixture occasionally. Add the chorizo, chicken and roasted red peppers. Let it simmer for a few minutes. Crack the eggs in the middle of the pan. Sprinkle the eggs with salt and black pepper and drizzle with olive oil. Place the pan in the oven and bake for about eight minutes, or until the eggs are set. Take the pan out of the oven and let it sit for five minutes. Divide the paella among bowls and serve. If you want to give this chicken, chorizo, and eggs paella recipe something extra, be sure to use Sauder Eggs. Our top-quality eggs will make any dish you cook even better. Use our store locator to find a retailer near you.